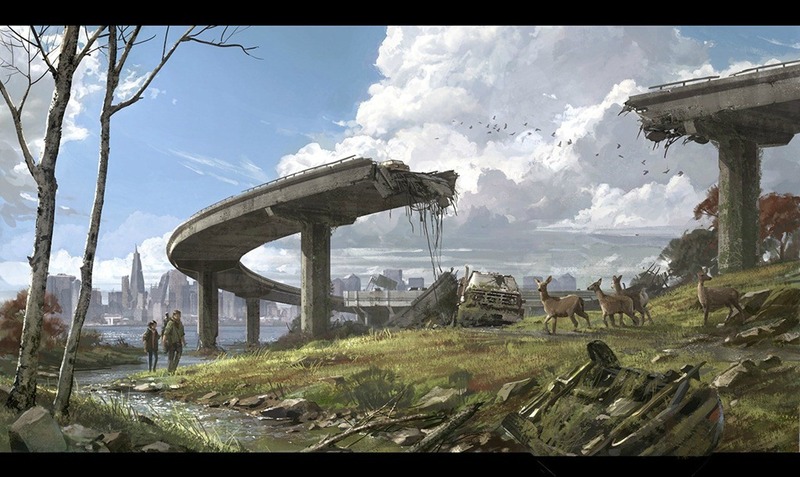 "The Art of 'The Last of Us'" by Naughty Dog Studios and Rachel Edidin. Haunting, beautiful, essential. I can't imagine what it must've been like to be a developer or artist involved in Naughty Dog's hugely acclaimed game "The Last of Us". Imagine being in a meeting on day one and being told "Your next task is to come up with Naughty Dog's next successful franchise." No mean feat for any developer, but one with the pedigree of Naughty Dog? The developers behind the massively successful Jak and Daxter and Uncharted series? When I first heard about "The Last of Us" I was so burned out on zombies and zombie-based games that I barely paid any attention to it at all. But as those first beautiful pieces of concept art were leaked to the press, and the first game trailer came along I started to pay a lot more attention. The Last Of Us does ruined civilisation better than any other game you'll see in the current console generation. For starters, the game's "infected" aren't just your run-of-the-mill undead. They're twisted humans, infected with a fungal parasite that at least has a basis in science fact rather than science fiction. 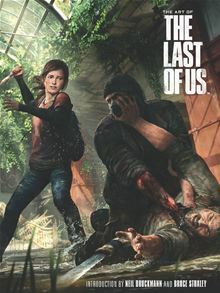 Based on the blight that some insects carry, that warps and twists their bodies into new and interesting - and entirely unnatural - shapes, Naughty Dog set out to twist the expectations that folk would have about their main 'baddies' and at least make an attempt to make them original and through that, more menacing. 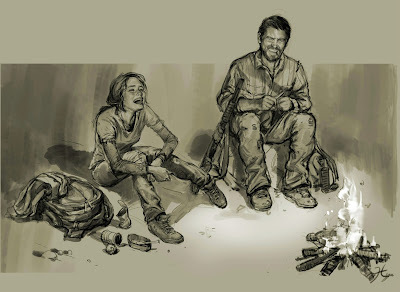 In the book we see how both Joel and Ellie (the main characters in the game) evolved, and how their looks changed as the game progressed. 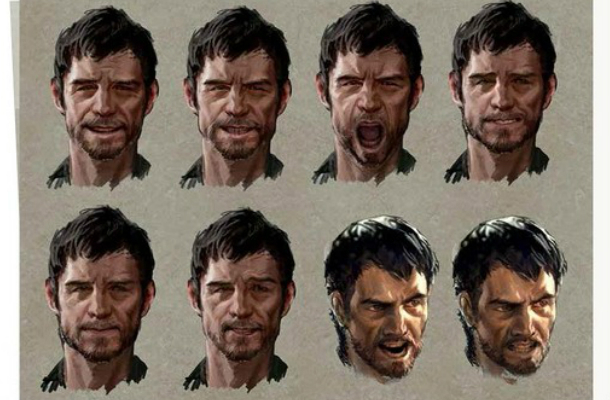 Having such a charismatic character as Nathan Drake to follow, Joel had to be sufficiently different enough, but with the dual-edged sword of being a bit of a nasty piece of work but still caring, even fatherly at times, it must've been a tough gig to design someone who would live on in the memory through being pretty ordinary but forced into extraordinary circumstances. 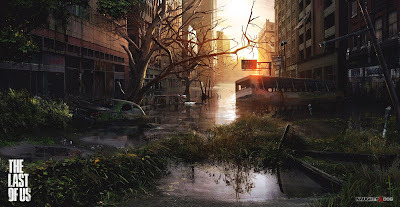 The stunning dystopian urban landscapes, shattered by years of neglect and slowly melting away and succumbing to nature are some of the game's real 'wow' moments. In the book the original concept paintings are shown alongside target renders and stuff that actually appears in the game. So many games have attempted to show the fall of civilisation, the slow drip-feed of nature's encroachment on humankind's domain, but The Last Of Us nails it perfectly. Seeing the full colour plates in the book makes you appreciate just how detailed these are, and how many reference pictures from disaster / war zones the artists must've picked through to get the look just right. Broken into sections that describe how the game unfolds, the book offers tantalising glimpses into what might have been. For instance, imagine the game with a female protagonist instead of Joel. Imagine Ellie as a wispy blonde girl rather than the gutsy dark haired teen we now know. There's also artwork from the limited edition comic that served as a prequel to the game, and though the art style is radically different, it's still interesting to read about things that pop up in the game as backstory. Most game-art books are fairly light on content and ridiculously expensive for what they offer. "The Art of 'The Last of Us'" is packed to the gunnels with brilliant and beautiful illustrations, so if you've played through the game so many times you could so blindfolded (yep, that'd be me), dive into the book to reveal even more of Joel and Ellie's world. An essential purchase not just for fans of the game but for folk who want to delve into the processes and evolution behind games and game characters. Probably my favourite illustration in the book. Brilliant!